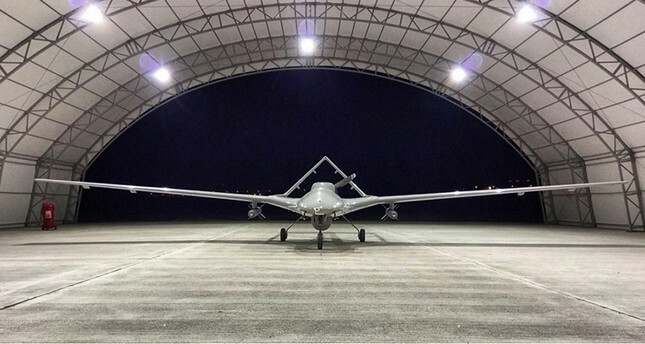 Turkey's first domestically-produced unmanned aerial vehicle Bayraktar TB2 has started to patrol the country's skies with locally-made rockets, according to a Twitter message by Selçuk Bayraktar, the chief technical officer of Baykar Makine, the manufacturer of the machine. The drone is carrying the MAM-L smart ammunition produced by Roketsan. In the photographs shared by Bayraktar, one rocket bears the message "Ömer Halis Demir, following you 24-7" painted on it. Ömer Halis Demir is the noncommissioned officer who shot and killed a coup plotting general on the night of July 15, seen as one of the most key episodes during the coup attempt that stopped the plotters in their tracks. The Bayraktar TB2 has been used as a surveillance drone by the military since 2014. The project is part of Turkey's efforts to satisfy its military needs through domestically-produced weapons. The Police Department has been using the UAV since June. The Bayraktar TB2, which is 100 percent Turkish and original, is used in terrorist operations in the country's eastern and southeastern Anatolia regions. The Bayraktar TB2 had proved its accuracy during shooting tests made with integrated national missiles in April. The UAVs are the premiere achievements of the Turkish defense industry. They are also force multipliers regarding the fight with terrorism, border protection and national defense power. Baykar was established by senior mechanical engineer Özdemir Bayraktar in 1984 for manufacturing delicate engines, pumps and gearbox pieces in the localization of the automotive industry and entered a serious research and development process to design and manufacture the UAVs and their subsystems in the 2000s locally. Bakyar Makina initially manufactured a micro UAV for the Turkish Armed Forces (TSK) in 2004 before the Bayraktar TB2 and carried out a weaponized trial, becoming the first national and original micro UAV in the TSK's inventory. The system was used operationally by the TSK in 2007. The Bayraktar Micro UAV is still actively used by the Turkish Land Forces Command, Special Forces, the Gendarmerie General Command and the Air Force. In addition, it is the first exported national UAV in the history of the Republic, as it was exported to Qatar in 2012. The Tactical Unmanned Aerial Vehicle System Development Program was started by the Undersecretariat of Defense Industry based on competition and without any research and development support as a two-stage program in 2009. Baykar met all the performance criteria targeted during flight trials that took place in the presence of an official committee in 2009 along with Bayraktar Tactical UAV System's Block 1 aerial vehicle platform. During these tests, the Bayraktar UAV's capabilities, such as departure, flight, landing and returning to hangar, were displayed in day and night flights. In the same period, Heron UAV systems rented from Israel were taking off and landing, remotely controlled by Israeli pilots. After signing a serial manufacturing contract in early 2012, Bayraktar TB2's first delivery was made in November 2014 (six vehicles) followed by a second delivery in June 2015 (also six vehicles). The TSK currently has 12 Bayraktar TB2 UAV systems in its inventory. The Bayraktar TB2 project has a record-breaking local share with a 93 percent participation rate in the defense industry. It is the first and only UAV system that completed test approval procedures designated by the military and the Defense Industry.